Last week I was asked to deliver a keynote presentation on sustainable project management to an audience of project managers in Australia at an Australian Institute of Project Management event. I started the presentation with a discussion about the future: our individual future, the future of our children, as well as the future of the project management discipline. I also suggested that we need to start a dialog on the type of future we would like to have, particularly given the challenges that are facing the world at the moment. We live in challenging times and increasingly complex world. We have record high housing prices, which results in a huge issue of housing affordability. We are seeing an aging population which puts greater demand on healthcare whilst also reducing the number of people in the workforce that generate taxes to pay for it. And most recently the Great Barrier Reef has suffered the largest ever coral bleaching event due to higher than normal ocean temperatures. It is easy to bury our head in the sand and pretend these things are not happening, or better yet, tell ourselves its someone else’s problem to solve. Project managers have a critical role to play in helping organisations and society deal with these challenges. As the world becomes more ‘projectified’ and the shift from ‘business as usual’ to project-based approaches accelerates, project managers as the deliverers of change play a critical role in influencing and shaping how these changes occur. But to lead this change and to solve these problems we need to alter our project management approach such that expand beyond triple constraints of time, budget, and scope to a situation where we also consider the impacts on and benefits to the environment, society and the economy. In other words, project managers become the drivers of sustainability. Many people initially think that sustainability and solely about the environment or being ‘green,’ however there is much more to the term. Sustainability involves each of us doing our part to build the kind of world – economically, environmentally and socially – that we want to live in, and one that we want our children and grandchildren to inherit. At a practical level, this involves each of us being aware of how our day-to-day choices affect the intricate balance of social, economic and ecological systems. In a project context, sustainability is the new ‘triple-constraint’ context that projects need to operate within. It probably comes as no surprise then that the number 1 world-wide trend in project management is ‘Green Project Management’: the incorporation of sustainability into projects and the and management of them. Most project managers I meet are ethical, professional and socially and environmentally aware, and they are quick to agree with the need to be more sustainable. But practically, what does this actually mean? How does a project manager be ‘sustainable’ and how can they incorporate sustainable practices into their projects? To help understand practically what sustainable project management is all about and to provide some specific guidance for project managers, I have pulled together the top seven sustainability improvements project managers can make. Sustainability is not solely focussed on being green or racing off and hugging the nearest tree. Sustainable project management starts with understanding the company’s value system and taking an ethical and principled approach to managing portfolios, programs, and projects. This means operating in ways that, at a minimum, meet fundamental responsibilities in the areas of human rights, labour, environment and anti-corruption. Responsible businesses enact these values and principles across their organisation, regardless of location and actively ensure that good practices in one area do not offset harm in another. But why a focus on principles? Principles release all stakeholders from the bureaucratic labyrinth. Individuals not only have room to make sense of daily choices, but the responsibility to do so. Principles are: universal, self-validating, proven in practice over many years and empowering. They invoke confidence and ability to influence and shape how the initiative will be managed and provide a framework of good practice for those involved. 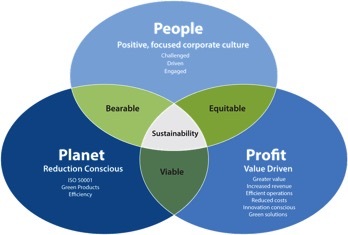 The P5 Standard for Sustainability in Project Management is the world’s first standard that brings together projects, their products as well as the sustainability elements of people, planet and profit. P5 is the glue that binds project and product lifecycles, reporting frameworks, such as the UN Global Compact and GRI G4, and social, environment and economic factors. P5 identifies a series of indicators and provides guidance on what to measure and how to integrate P5 into project activities and can also be used by CSR professionals to support their sustainability reporting to include projects. In doing so, the elements of P5 can be used as part of the project risk assessment to identify specific sustainability risks as well as any material business risks to revenue, investments and or reputation. A project consists of a unique set of processes consisting of coordinated and controlled activities with start and end dates, performed to achieve project objectives. P5 measures project objectives and deliverables, their intended life spans, servicing, and project process for maturity and efficiency perspective against elements based on the triple bottom line. P5 considers the product’s life cycle from a social, environmental, and economic perspective. During each project phase sustainability should be accounted for to ensure the product’s project from the time the idea for the product is conceived until it is handed off in its final form. This includes planning product realization, designing and developing, (that should consider quantity and types of materials, chemicals used, energy efficiency and recyclability) production and servicing. Each product has social, economic and environmental impacts which may be recognized by a series of related projects during its product life cycle. Projects can include physical design, software design, marketing, testing, and packaging, for example. In applying the P5 Standard, the project manager can assess their project management processes, delivery processes and support processes as well as the products and deliverables produced by the project to determine what, if any, social, environmental or economic impacts, both positive and negative, the project may create. GPM developed the Projects Integrating Sustainable Methods (PRiSM) methodology to provide specific guidance to project managers and project teams on how to incorporate sustainability into the project lifecycle. PRiSM was updated in 2015 and restructured as flexible framework, to take a total lifecycle approach, whilst allowing the integration with existing frameworks and methodologies such as PRINCE2, the DSDM’s Agile Framework and other bespoke approaches. At the core of PRiSM is the development of Sustainability Management Plan and the completion of a sustainability impact assessment for the project. The key purpose of the SMP is to serve as a useful starting point for project managers to enhance the communication of business value and to link sustainability principles in a project context. PRiSM also mitigating environmental and social risks and also risk to brand and business reputation. Last year I attended the IPMA Research Conference in Stellenbosch, South Africa. At the conference, Associate Professor Carl Marnewick delivered a fantastic presentation on sustainable projects. Professor Marnewick provided some practical suggestions as to how sustainability can be considered in sixteen different components of the project (Figure x), from the project business case trough to final project acceptance. When you examine the details in Figure 6, it is not too difficult to see how we can take a sustainable approach to the project, not only in terms of the product produced, but also the management of the project itself. A great first step is to conduct a sustainability assessment on your project. This will allow you as the project manager to get a better understanding of how both the project and the product produced by the project creates either a positively or negatively impacts any specific social, ecological or economic circumstance. [Spoiler Alert!] GPM will be releasing software soon to allow for project level assessments that all members will have access to so stay tuned! In essence, a sustainability assessment helps you as the project manager to do the right things in the right way for the right reasons. 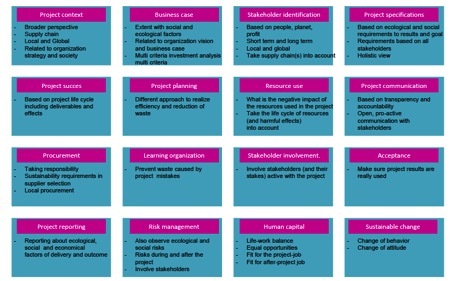 This assessment also helps to gain a better understanding of key project risks, can assist with the understanding of stakeholder impacts and in turn the development of a more complete stakeholder analysis or engagement strategy, or may simply provide new insights on where the problem areas may exist in the project. Our experience has shown that using the categories in the P5 Standard and then scoring using simplified Analytic Heirarchy Process (AHP) allows for a simple and easy measurement of both positive, neutral and negative impacts. A simplified AHP uses a scale from -3 to +3 to rank the impact. These impacts could be incorporated into a Sustainability Plan, or may be simply logged and managed in a similar manner to project risks. The area of procurement provides substantial opportunities to be more sustainable and to make some positive impacts both for your project and your organisation more broadly. Not only can we save money and eliminate waste through more sustainable procurement, but we can also drive improved practices in suppliers by requiring adherence to particular standards to compliance with specific sustainability policies. Suppliers and the supply chain more broadly is a source of many significant risks, not only to the project itself but also to the reputation of the organisation. We have recently seen the massive damage a breech of consumer trust has made to Volkswagen Group and in time we will see how the company deals with the law suits, regulator imposed penalties and consumer backlash that could easily reach $1 Trillion US. This is not a new thing. Over the past two decades’ reputational risk for organizations has become more complex as consumers, stakeholders, and investors changing expectations have resulted in an increased demand for eco-friendly and socially conscious products and services. So as a project manager, regardless of the industry sector you work in, think about how you can achieve a better outcome, often without spending any more money, by practicing sustainable procurement. I find it intriguing that project managers always talk about the project life ‘cycle’, but what they actually mean is the project life ‘time’. By definition a project has a start and an end, meaning the project exists for a discrete period of time. A life ‘cycle’ in nature is a true cycle, with there being no start or end, but instead there is a continuous and ever evolving set of actions. Conventional project management thinking is linear in nature. We acquire resources, then use those resources, then discard them once we have no further use for them. But what happens to those resources after we discard them? If we are talking about project team members, where do they go and what do they work on once they finish on our project? If we are talking about materials, what happens with the left over materials? What happens with the waste that is produced? The answer lies in the concept known as Cradle to Cradle (C2C) design. C2C design is a biomimetic approach to the design of products and systems. It models human industry on nature’s processes viewing materials as nutrients circulating in healthy, safe metabolisms. Put simply, C2C it is a holistic economic, industrial and social framework that seeks to create systems that are not only efficient but also essentially waste free. C2C thinking can be applied to many aspects of human civilization such as urban environments, buildings, economics and social systems, such as projects. Identify potentially new revenue streams through the sale of by products or waste. Project managers have a unique opportunity to deliver economic and environmental results for society. Approximately $90 Bn is spent on projects each year around the world. Without considering sustainability, project managers miss an opportunity and we shirk our ethical obligations by not minimizing the impacts our projects have on society or the environment. Also, many Codes of Ethics and Codes of Practice require the project manager to incorporate sustainable practices into their projects and examine the impacts on the planet, society or the economy. If we want to be considered a profession, then it’s time we stand up and take responsibility for what we do and the impacts we create. Interesting article. Thanks. Very down to earth. The challenge is as a rule to differentiate between the reformist view and the radical view on sustainable development – and see the practical implications. The traditional, reformist view seeks to achieve economic growth while balancing this interest with social welfare and protecting the environment. – Sustainable development is thus just a political goal in parallel with other political goals. In the traditional system, the economical interests will always be given priority. Ecology will lose when traditional decision-makers must choose. To achieve sustainability, the economy and social welfare demands must adapt to the ecological limits. Other wise we inevitably end up in the “Mickey mouse” model.